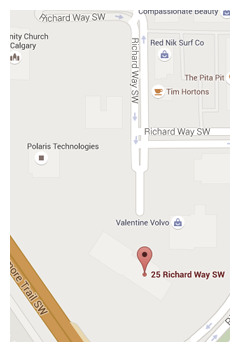 Our extensive collection of Audi lifestyle products and accessories is designed for the passionate Audi owner and fan. From apparel to sports and outdoor equipment, Audi has you covered wherever life takes you. Audi’s lifestyle collection and genuine accessories are designed with the same attention to detail and craftsmanship that goes into every Audi vehicle. Designed to enhance your ownership experience, these products are also meant to compliment perfectly your active lifestyle with the quality and durability you expect of any product bearing the four rings. With the same timeless design as any Audi vehicle, Audi’s apparel collection is the perfect extension of Audi passion for the true enthusiast. 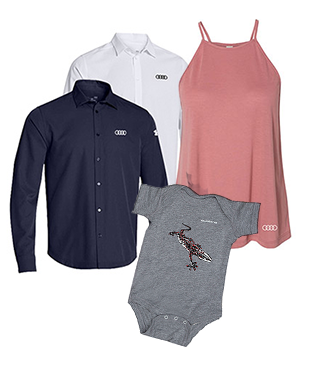 There is apparel for every occasion for men, women, and kids in the Audi lifestyle collection. From golf polos to hooded sweatshirts, zip up shirts, t-shirts, jackets, sports belts, and windshirts, Audi apparel is the perfect accessory when you step out of your Audi. Audi apparel is built to last using the best materials. Our collections also feature products from the world’s top apparel companies like Under Armour, Adidas, and North Face. Get ready to make a bold fashion statement. For the discerning Audi enthusiast, Audi accessories include a wide range of products such as sunglasses, hats, caps and socks. These are the perfect compliment to your Audi apparel and feature the same quality and durability you find in everything Audi creates. 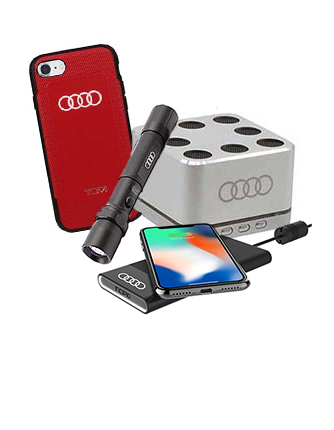 Audi accessories also include traveling mugs and drinkware perfectly suited to your active lifestyle as well as pens, bags, jewelry, pet accessories, wallets, scale models and hundreds of other products. 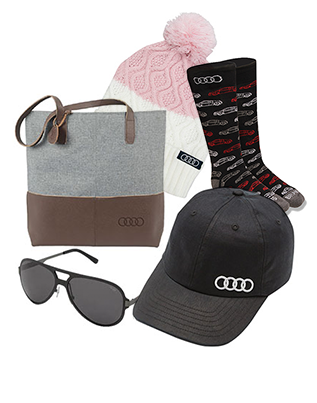 Audi accessories are the perfect gift for any Audi aficionado, and they make the perfect gift. Regardless of need or budget, there’s an Audi accessory for you or a loved one. Audi vehicles are among the most connected on the road and you would expect nothing less from Audi’s lifestyle and accessories collection. Browse our technology products today to find unique cellphone cases for your iPhone, stylish powerbanks for your iPad, Bluetooth portable speakers, stands for your Apple Watch and even virtual keyboards. You can even find flashlights, multitools and quattro-powered drones. Audi accessories enhance the technology around us and make your world a simpler, easier one. Audi has partnered with Thule, B&O, Braven and Oglio to bring you some of the world’s highest-quality accessories that protect and improve the technology you use every day. Audi is all about blending performance and efficiency to create a perfect balance in every situation. That’s also true of Audi’s sports and outdoor accessories which are designed to improve your golf game, get you to the top of the mountain in complete comfort, or simply help you enjoy your weekend. Audi sports and outdoor accessories include golf bags, a wide range of sunglasses designed by some of the world’s most respected brands such as Under Armour, D’Blanc, and Tom Kristensen, golf balls, divot repair kits and so much more. 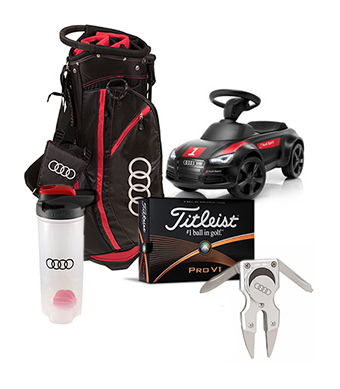 From the links to the track, Audi and Audi accessories are a step ahead of the competition. Browse our sports and outdoor products to find the perfect gift for the outdoor enthusiast in your life.